This prayer above for Mary's Second Sorrow, the Flight into Egypt, (pictured above in this rendering by Fra Angelico), brings to mind the aged Simeon’s words from the First Sorrow, that her newborn son would be a “sign that would be contradicted” (Luke 2:34). Unfortunately, they inquired as to Jesus' whereabouts from the then current king, Herod the Great. “Great” is probably a better term to describe the many buildings he erected during his reign, including his impressive reconstruction of the Second Temple in Jerusalem. Herod himself was a ruthless paranoid leader who thought nothing of having anyone he thought was a threat to him murdered, including quite a few family members and rabbis over the years. The Roman Emperor Augustus once observed that it was better to be Herod’s pig than his son! So when the Magi asked about Jesus’ whereabouts, Herod saw this little baby as “competition” for his “turf”. As St. Alphonsus Liguori put it in his great work The Glories of Mary “Herod, having heard that the expected Messiah was born, foolishly feared that he would deprive him of his kingdom." The upshot was that, soon after the Magi left Bethlehem, an angel told Joseph in a dream to flee for Egypt immediately with Mary and Jesus. He warned Joseph that Herod would soon order the massacre of all boys under the age of two in Bethlehem, the place of Jesus' birth, to make sure the child was killed! Talk about, as Simeon said, a sign that would be contradicted! Our Savior is just an innocent little baby here but already He's being marked for death! Speaking of innocence, what we now know as Herod’s Massacre of the Innocents took place soon after. The road they traveled was, according to St. Bonaventure's description of it, "rough, unknown and little frequented.” “As they were destitute," says St. Basil, "it is evident that they must've labored much to provide themselves with the necessities of life." Clearly, Our Blessed Mother, Joseph, and their Divine Son experienced what so many people have over the centuries up until this present time in fleeing persecution! And yet, Mary and Joseph still had faith in God and in His sacred purpose for them as they carried their Divine Son, our Redeemer, on their journey. What an image of humility this is, the Creator of the world, assuming human flesh and human vulnerability, all for us! 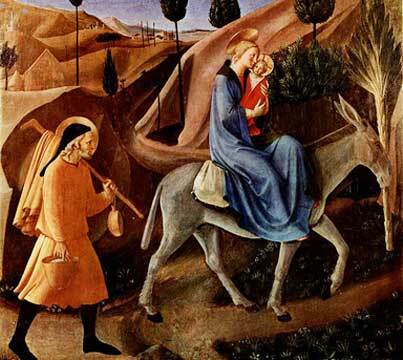 The Holy Family left Egypt for the town of Nazareth in the region of Galilee after Herod’s death. It is worth noting, as Matthew does in his Gospel (Matt 2:15), that this fulfilled the prophet Hosea’s prediction in Scripture: “Out of Egypt I called my Son” (Hos 11:1). We ask Mary in the prayer Hail Holy Queen that “after this our exile, show unto us the Blessed Fruit of thy Womb Jesus.” This Second Sorrow shows us how Our Lord and His Blessed Mother were not strangers to the notion of being exiles themselves!